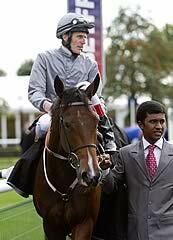 Rosdhu Queen maintained her unbeaten record in a dramatic race for the Jaguar Cars Lowther Stakes at York on August 23. There was drama after about a furlong when the hot favourite Newfangled was pulled up by William Buick. Rosdhu Queen (9-2), a winner at Newbury last Friday, was quickly out of the stalls and her jockey Richard Hughes was able to dictate affairs. The filly, giving trainer William Haggas a birthday winner, had enough in hand to hold Baileys Jubilee by a length and three-quarters with Royal Rascal a head away in third. Haggas said: "That wasn't the plan, we were going to ride her for third and hope that we got lucky. "I don't normally run them back this quick but Steve Parkin who owns her is a Yorkshireman and so am I, so what have we got to lose? We may as well have some fun, it's what we do it for. She's pretty good." Hughes said: "Plan A was to drop her in and ride her to get the trip, but we landed in front and I wasn't going to pull her back. A furlong out I gave her a kick and she kept going. It's funny how things work out. Ryan should have ridden her but he broke his wrist on a horse I'd have been riding if I hadn't picked up a ban."